An RNZAF pilot that stands out as interesting to me is Kenwyn Rowland Sutton who served in Fairey Battles in the Battle of France and Defiants in the Battle of Britain. He later flew Havocs, Bostons, Mosquitoes, and then lost a leg and an arm. NZ2174; Born Wellington 18 May 1919; RNZAF 1 Apr 1938 to 14 Mar 1939; RAF 15 Mar 1939 to 15 Mar 1944, 36182; RNZAF 16 Mar 1944 to 1 Aug 1947, Pilot. Citation mention in Despatches (1): (NY1941) For distiguished service with 142 Sqn. RAF (Battle) with the AASF in France. Citation Distinguished Flying Cross: (23 Mar 1942): [23 Sqn RAF(Havoc)] This officer has proved himself to be a first class operational pilot. He participated in the first intensive air fighting in France during May and June 1940. During one sortie, he destroyed one and damaged another enemy aircraft before being shot down himself. Since then Flight Lieutenant Sutton has taken part in numerous patrols both by day and by night. As a flight commander he has shown sterling qualities and he has been mainly responsible for the high standard of efficiency in his flight. Citation mention in Despatches (2): (14 Jan 1944) For bravery in action and meritorious fulfillment of duty with 605 Sqn RAF (Boston). During the Battle of Britain flew with 264 Sqn RAF (Defiant). CO RAF Station Landbehr Aug 1943-Nov 1945. member of the 'Caterpillar Club'. On 2 May 1943 while flying a Mosquito of 85 Sqn RAF he was shot down by Canadian anti-aircraft fire over brighton, England. He baled out but was struck by the propellor as he left the aircraft, losing his left arm and lower left leg." The entry also notes he served from 1947-1980 as Operations Officer for National Airways Corportation at Palmerston north, Paraparaumu and Wellington. Does anyone here have more information on this man? Did anyone here know him at all, perhaps from NAC/Air New Zealand? And as By Such Deeds does not mention a date of death, is there a chance he's still alive today perhaps? Does anyone know him? I know it's unlikely but only the other day we discussed a kiwi Battle of Britain chap who only just died that was not on any of the recent survivors lists. Middle name Roland correct in your heading but misspelled Rowland in text. He died 6 Jul 03. Ashes buried at Awa Tapu Cemetery, Kapiti. Thanks, a pity he's no longer with us, he'd have had a few tales to tell I'd bet. 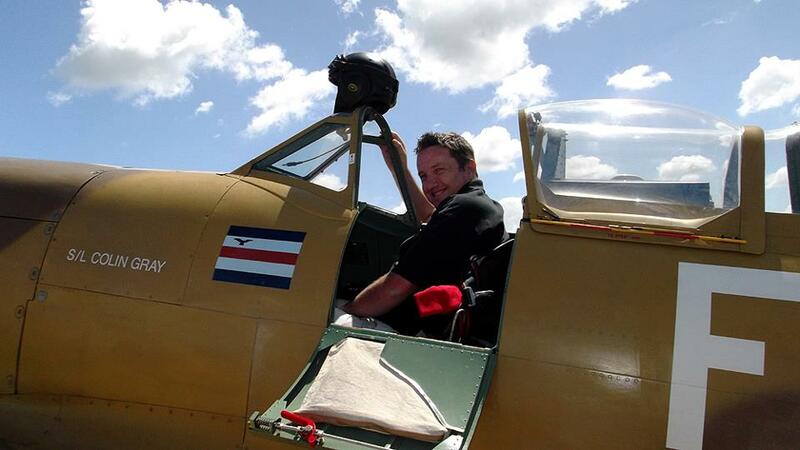 As mentioned Ken was NAC/AirNZ Ops for many years...a great guy and very popular. The loss of an arm and a leg has not prevented a New Zealand airman now in Britain from trying his best to be posted back to operations. He is Squadron-Leader K. R. Sutton, D.F.C., son of Mr. A. V. Sutton, of Oamaru, and grandson of Mr. W. Sadler, of 4 Horopito Street, Mount Eden. He had his left arm and left leg amputated last April after being shot down in mistake by British anti-aircraft gunners, but he left hospital after a brief period and is now commanding an Air Force station in North Wales. In a recent letter he said he hoped to be flying again shortly after writing. Squadron-Leader Sutton was born in Wellington and educated at the Palmerston North Boys' High School. In June, 1939, he accepted a short-service commission in the Royal Air Force, and he was one of the first New Zealanders to be sent on active service after the outbreak of war. He raided the German lines in May 1940, and participated in intensive air fighting over France in that and the following month. He was awarded the D.F.C. in March. 1942, when he was flying a Havoc in night intruder patrols over enemy aerodromes in France. I wonder if he got back into the cockpit. You read of occasional one armed pilots and of course legless like Bader. Haven't heard of arm and a leg? Real fighting spirit eh?